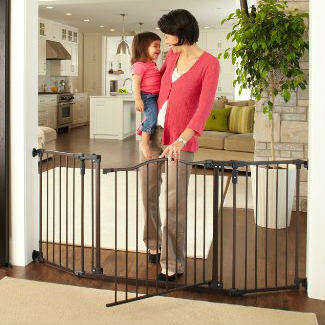 The Evenflo Soft and Wide Gate is a highly rated mesh baby gate. 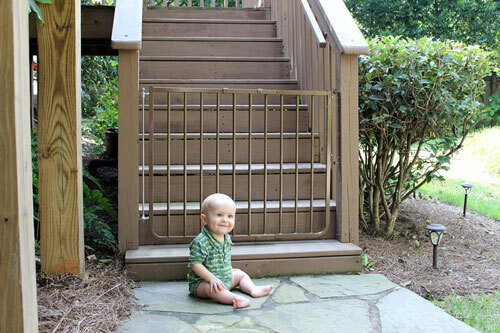 Baby gates are a necessary tool for keeping kids safe in many homes, but many baby gates can be cumbersome and cramp a home’s style. 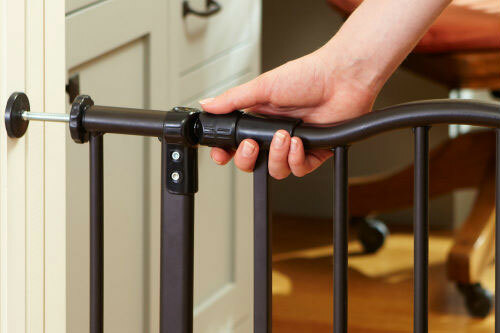 Fortunately, there are great mesh baby gate options that operate smoothly and elegantly blend in with home decor. 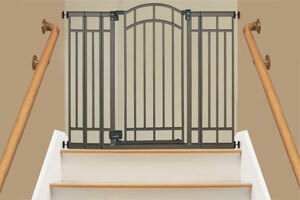 Most of the mesh baby gates available are retractable models. 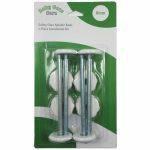 These tend to be extremely popular as they are easy to use and essentially disappear when not in use. Many retractable models afford one-handed operation, too. 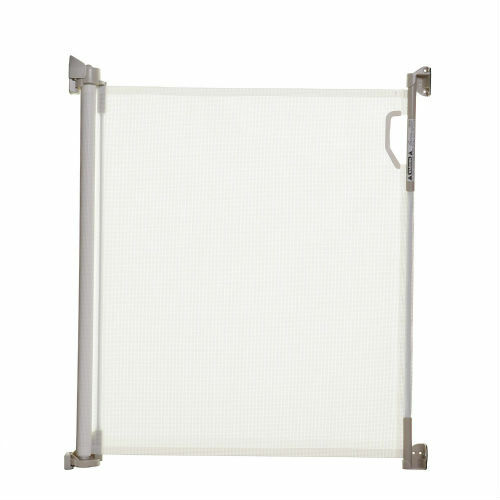 There are also some pressure mounted and hardware mounted mesh baby gate options for those who prefer a non-retractable gate. We’ve compiled a comparison chart of some of the best mesh baby gates to provide an overview of available options. We hope this information is useful for you in finding the right one for your home! 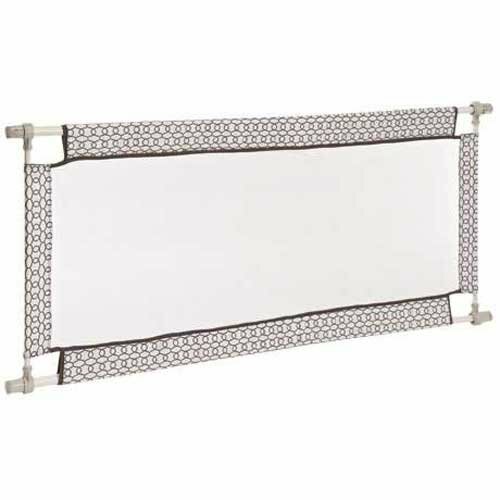 Hopefully the comparison chart above is useful in getting a quick sense of the variety of mesh baby gates that are available at different price ranges. Below we’ll highlight our favorite retractable, pressure mounted, and hardware mounted models in more detail so you can get a sense of which type of gate may work best for your home. 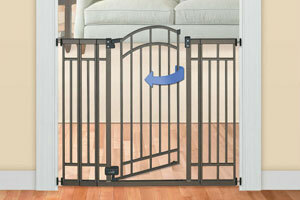 The Retract-A-Gate Safety Gate is the highest customer rated retractable mesh baby gate on our list. 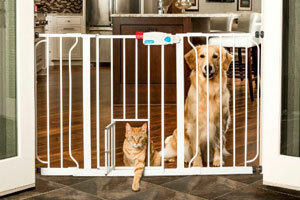 This gate comes in two sizes: a standard 52″ wide version and a 72″ version that costs slightly more. 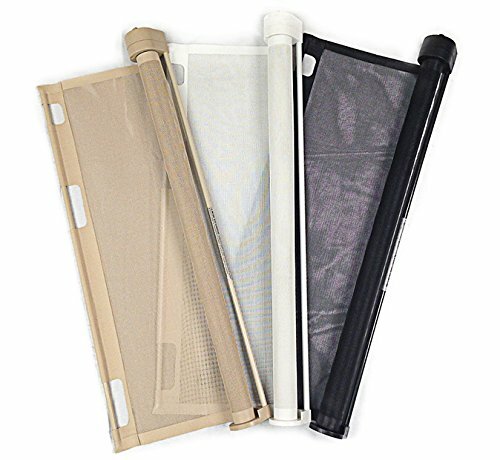 The gate also provides color options for buyers, and comes in a clean white, cafe brown, or black for both sizes. One reason this gate earns such high praise is its high-quality material. 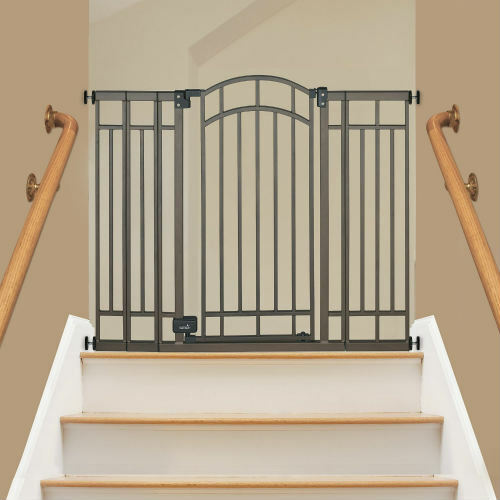 While some mesh baby gates are not very strong or durable barriers, the Retract-A-Gate uses a high quality mesh that is specially designed to be both sturdy and scratch resistant. Function and safety are also central to this gate’s design. The opening mechanism for this gate requires just one hand to operate, which is an obvious asset for parents who often have at least one hand full. There is a child safety lock on the top of the opening mechanism so kiddos can’t open it. Another bonus of this gate is that it opens and closes quietly. The Retract-A-Gate adds another feather in its cap with a JPMA certification that approves the gate for use at the top and bottom of stairs. The Retract-A-Gate is a little pricey compared to other models, but based on parents’ feedback the cost seems justified. 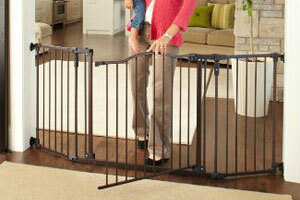 The Summer Infant Custom Fit Gate is a hardware mounted mesh baby gate. It is composed of three configurable panels, which used all in conjunction can span from 87 inches up to 143 inches. If you instead choose a two panel arrangement, the gate will span from 65 to 87 inches. The gate stands 30 inches high. The passthrough for this model is located in the small panel, and is a swinging gate. The gate can be opened using one hand for adults, but it childproof. Another useful aspect to note is that if two of these gates are purchased, you can actually combine them to form a play yard. 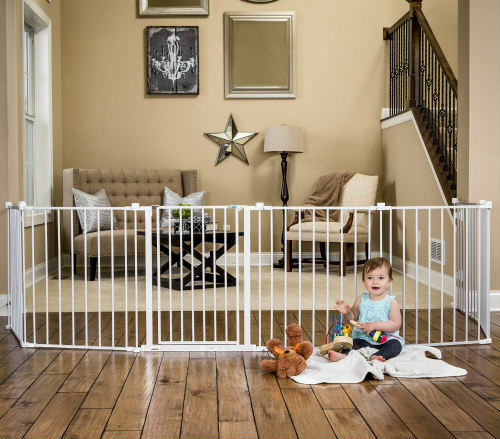 The Evenflo Soft And Wide Gate is a pressure mounted mesh baby gate that has earned the overall highest rating of any gate on our list. This model has some convenient and thoughtful features. 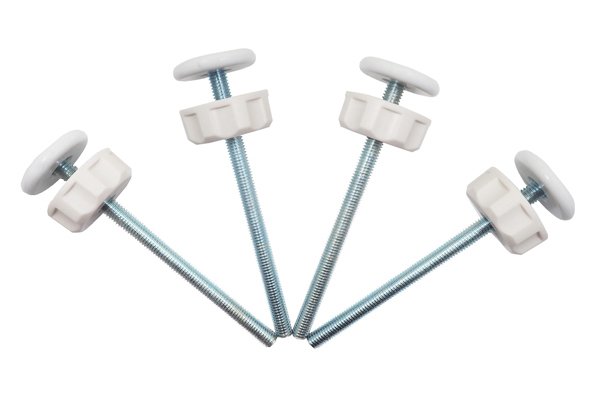 The pressure mounting aspect of the gate means that no tools are required to mount the gate. 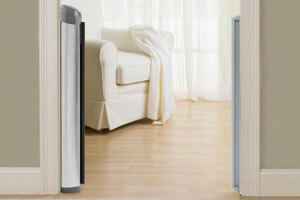 Its width is adaptable and is able to span spaces from 38 to 60 inches wide. 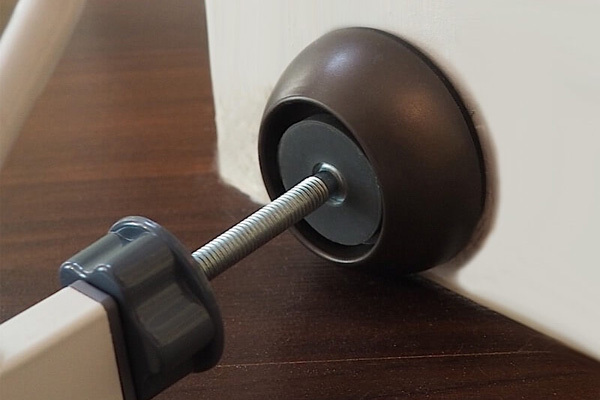 It stands 27 inches tall, and the mounting feet are coated in rubber to prevent damage to your walls. It is also lightweight and is easy to move when needed; in fact it is easy to completely take down and put away when you have company. The mesh is of a good quality and is machine washable. One drawback of this gate is there is no way to pass through it, so parents have to step over the 27-inch-tall barrier to get from one side to the other.